Greetings From Hotel Shree Sai!!! Hotel Shree Sai is situated at strategic location on the Busiest Main Road Touching The Pune – Bengaluru Express Highway (Opp. Ruikar Coloney), Hotel Shree Sai is in Quiet N Serene Area Of Kolhapur. It Is A Executive Class Hotel With Variety Of Facilities & Services in Periphery around. Hotel Shree Sai Has Well Appointed Specious 17 Rooms At Reasonable Tariff. We Have All Air Conditioned Double Bed Deluxe & Super Deluxe AC Rooms. 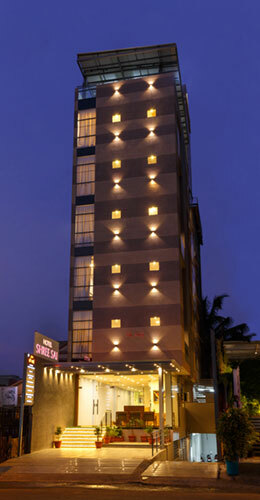 Hotel Shree Sai is Executive class Hotel with variety of facilities to offer. Hotel Shree Sai has well appointed 17 luxury rooms with 24 hours checkout facility, full furnished, Air conditioner, LED TV with Set Top Box channels, 24 hours hot and cold shower, Free Wi-Fi connectivity, Shoe Shine and Room amenities. Covered Car Parking / Valet available within premises. We also have Conference / Banquet hall with capacity of 60 to 80 persons. A Restaurant serving pure Vegetarian Food & room service available from 7.30am to 11.00pm We have categories of rooms like Deluxe & Super Deluxe complementory break-fast is offered to the room resident under CP* Plan.